I know you mean well, but you can really stop pummeling me with coverage about “Archie #600”. Even if the developments therein weren’t being covered by every single newspaper in the city… let alone all media , now known or hereinafter devised – I’ve been “Hangin’ with the Riverdale” crew for over twenty years now. I have three different re-prints and collections containing Pep Comics #22, I own the crossover with the Punisher, heck I own Dan DeCarlo’s spicy pin-up collection (not the really spicy one… just the “kind of unnervingly saucy” one). I remember January McAndrews, Jughead’s Diner, and the amazing year-long advertisement that was “Archie’s R/C Racers“. I can generally narrow re-prints down to decade based on the backup features (Katy Keene, Frankie and Me, Lil Jinx, Josie and the Pussycats). I know the name of Sabrina’s uncle. I can’t find a good link to Sabrina’s uncle… but I guess he was on the 90s live-action sit-com as well as the 00’s manga reimaginings… so that’s not as obscure as I’d hoped. Listen Internet I don’t need any lip from you… do you remember when “The New Archies” turned Dilton Doiley into an African-American kid named Eugene and gave him a superfluous sister? No? I do. If two decades of a weird hybrid of fandom and “scholarship” have taught me *anything* it’s imaginary stories about “how the love triangle between Archie, Betty, and Veroinca is going to work out” are always…. always really disappointing. Update: Robot 6 points out that the Archie characters have their own blogs where they post about plot developments… and that Betty’s weekly post is just about the saddest thing on the Internet. 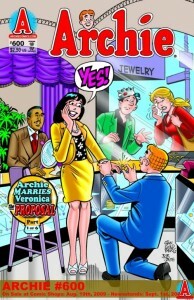 I love how Archie appears to have proposed to Veronica in the middle of the jewelry store… hopefully right after she bought the ring for him to give to her! I love Jughead’s outfit. Green sports-coat with black dress-shirt? He’s clearly a man on his way to a St. Patrick’s day parade with a dress code.